This time last year we were in a very different climate! Here are some pictures of our house, and the snow fall we got last night. No schools are closed or anything. Just another day in Michigan! Our house! The smallest one on the block! I really like the area where we live. 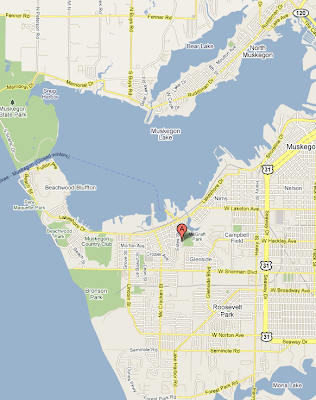 Lakeshore Drive is a very "small town" where as the rest of Muskegon is pretty much chain store "anywhere America". We have the park behind us and the creek, and Lake Michigan is just around the corner. It will be very easy to run out for a quick surf on the lake this summer. When we get our next boat, we have a large marina right up the road! 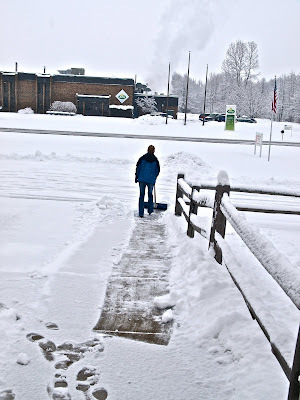 LeeAnn shoveling snow while I play with the camera... Heh heh heh. Michigan's finest. Keeping those roads safe! Glad to see your writing again. I found your blog late and got hooked. We keep out sailboat at Torresen just up the road from you! Hope to someday follow your lead. 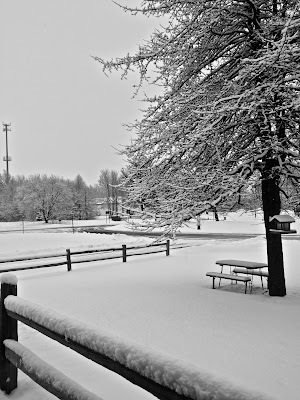 Nice photos; looks like a good snow. What are you doing for a "real" job, now that you are off the boat?